I just realised most of my vegetarian meals contain chickpeas. We go through a lot of chickpeas in this house! So it's definitely time to try something different. I've always loved satay but hubby hasn't been keen. So when he mentioned he'd like to try one I jumped at the chance to try this recipe from Smitten Kitchen that I've had my eye on for ages! The original recipe called for plain tofu but that gives me the heebies so I used a marinated Thai style tofu instead. Sweet chilli tofu nuggets would also be a great choice. The fresh vegetables were lovely and crunchy and honestly, I could have just eaten them with a bowl of the sauce to dip into and been a very happy girl. Fresh, creamy, crunchy and absolutely delicious!!! Place the peanut butter, soy sauce, garlic, ginger, chilli, sesame oil and honey in a large jug. Pour over the boiling water and whisk to combine. Slice the capsicum and carrot into thin batons. Fry the tofu until it is crispy and golden then slice into small cubes. Cook the noodles in salted boiling water for 2-3 minutes then drain, reserving about 1 cup of the cooking water. 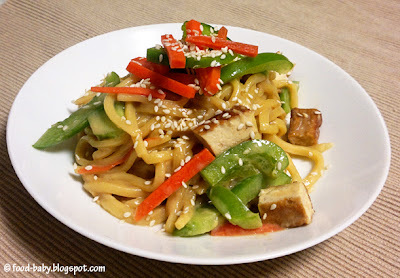 Return the noodles to the pot and add the sauce and chopped veges. Stir well to combine and add a little of the reserved cooking water if it looks a bit gluggy (I needed about 1/2 cup). Serve topped with sesame seeds and a squeeze of lime. Serves 4 as a main or 6-8 as an entree.